I have some time to kill because I'm recovering from elective foot surgery for my left foot. So in the meantime, I'm killing time by tying flies, reading, tying flies, watching Netflix, tying flies, making plans for a September trip to Colorado, driving my wife crazy and making some items for my backpacking trips, you get the picture. I bought a square yard of dyneema composite fabric to make stuff sacks using a non-sewing method and they turned out quite well. I had some leftover DCF and yesterday, I threw together two tenkara rod sleeves which turned out quite nice. I have a Zimmerbuilt Tailwater pack which has a great option to transport two rods via rod sleeves on the outside of the pack. The sleeves only cover the majority of the handles which leaves some of the rod exposed. Not really a big deal but I tend to obsess over things like that. 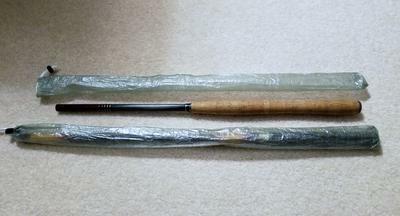 The pack sleeves are just big enough for the rods themselves so if I try to leave the rod in its supplied rod sleeve, it's difficult if not impossible to put it into the pack's sleeves. The DCF is .51 oz weight per sq yard and it's very thin but durable. Now, I can put the rod into the DCF sleeve and it easily fits into the pack's sleeves. The DCF sleeves themselves weigh about 0.3 grams each making them extremely lightweight. I'm liking this!--The market may be relatively small, but perhaps you can go into production. Light yet tough sounds like a good combination for tenkara rod sleeves. I have been wanting to make a sleeve for my Tenryu Spectra. This is the solution! I am going to construct a case out of wood, but kept wondering about the sleeve. A great Big Thank You Rob. Hope and pray the foot heals quickly. Rob. What kind of adhesive did you use? Use Seamstick for sail cloth or go to ripstopbytheroll dot com. They carry the tape also. I used a double sided basting tape named Seamstick. It can be found at Sailrite. Use the tape for sailmaking, not the one for canvas.